Axl Rose is an American musician, singer and songwriter, best known as the lead vocalist and frontman of the heavy rock band Guns N’ Roses. He is widely regarded as one of the most iconic and controversial performers in rock history. Born on February 6, 1962 in Lafayette, Indiana to William and Sharon Rose, he had a difficult childhood and his parents divorced when he was only two years old. Rose has openly declared that he was sexually abused by his father and physically abused by his mother’s new husband, Stephen Bailey. He became interested in music from an early age and started singing in church and learning to play piano while still in grade school. Rose left home at a young age and moved to Los Angeles in 1982. 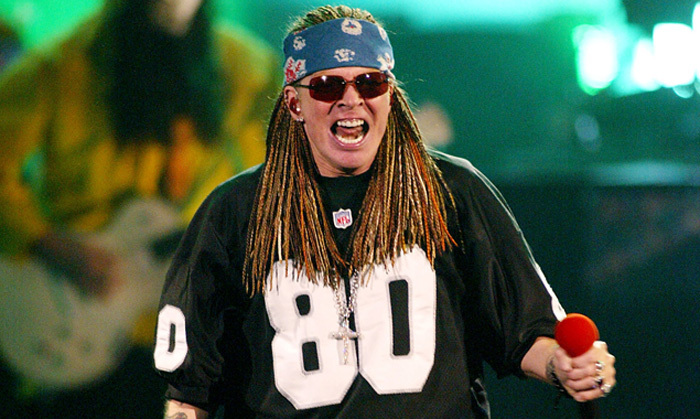 After coming to Los Angeles, Axl Rose initially sang for a number of bands, including Rapidfire and L.A. Guns, before forming Hollywood Rose with his childhood friend Izzy Stradlin. Rose co-founded Guns N’ Roses in 1985 with his former band mate Tracii Guns by combining Hollywood Rose and L.A. Guns. The band’s lineup at that time consisted of Axl, Tracii Guns, Ole Beich and Duff McKagan. Guns N’ Roses underwent a number of line-up changes, and lead guitarist Slash and drummer Steven Adler were eventually recruited in 1985. They played their first concert at the Troubadour club in Hollywood. The band, after establishing a loyal audience by playing regularly on the L.A. club circuit, signed with Geffen Records in 1986. Guns N’ Roses released their debut album, Appetite for Destruction, in 1987. The band achieved worldwide fame with the tremendous commercial success of the single “Sweet Child O’ Mine”. The album has sold more than 30 million copies to date. The band followed it up with Appetite for Destruction (1987), G N’ R Lies (1988), Use Your Illusion I & Use Your Illusion II (1991), and “The Spaghetti Incident?” (1993). From the early 90s, bitter rivalries began to develop in Guns N’ Roses, but Rose managed to obtain the sole ownership of the band’s name. Consequently, Slash, McKagan and Sorum all decided to leave the band. The long-rumored album, Chinese Democracy, was released in 2008 and Duff McKagan made a surprise appearance during their performance at London’s The O2 Arena in October 2010. Axl Rose was awarded the Ronnie James Dio Lifetime Achievement Award in 2014. Axl Rose married Erin Everly, the daughter of singer Don Everly, in 1990. The couple annulled their marriage in 1991. He started dating supermodel Stephanie Seymour and they got engaged for a brief period of time. Rose is a controversial rock star whose contentious lyrics and erratic behavior have often provoked public outcry.